The Cherokee County Conservation Board (CCCB) maintains over 1200 acres of parks, wildlife areas, river accesses, preserves and natural resource areas. Cherokee County Conservation offers a total of 39 modern campsites & 36 primitive campsites between Silver Sioux Recreation Area and Martin's Access with showers/flush restrooms located in both parks. Larson Lake, Stieneke Access and Ranney Knob offer a wonderful primitive camping experience enjoyable for the entire family. Martin's Access boasts three 16x22 feet reservable cabin's each with a full restroom and shower, two queen-sized bunk-style beds, kitchenette and outdoor patio area. New in 2014 at Martin's Access is a 30x40 feet cabin that has 3 bedrooms with 6 queen size beds, sectional sofa, full bathroom with ADA shower, and full kitchen with stove, fridge, microwave and dishwasher. The new cabin also has 4 round tables with 24 folding chairs and outside patio with a built-in fire ring and stand up grill. Silver Sioux is home to The Lodge that offers a full restroom with shower, kitchen with a full sized range, 8 full-sized bunk-style beds, serving table with seating for approximately 40 people, and an outdoor patio area with a built in fire ring. While staying in Cherokee County Parks you can take a scenic hike on over 10 miles of trails and explore the diverse flora and fauna that makes Cherokee County a special place. If you want to take it a little easier saddle up your horse head to Martin's Access to ride on over 5 miles of trails and roads through Oak Savanna, Woodland, and Prairie ecosystems. Cherokee County in northwest Iowa is an ideal destination for hunters and anglers, campers, history buffs, artists and art lovers, canoeists, families and anyone interested in a relaxing and scenic retreat from the daily grind. Private outdoor patio, grill and fire ring. 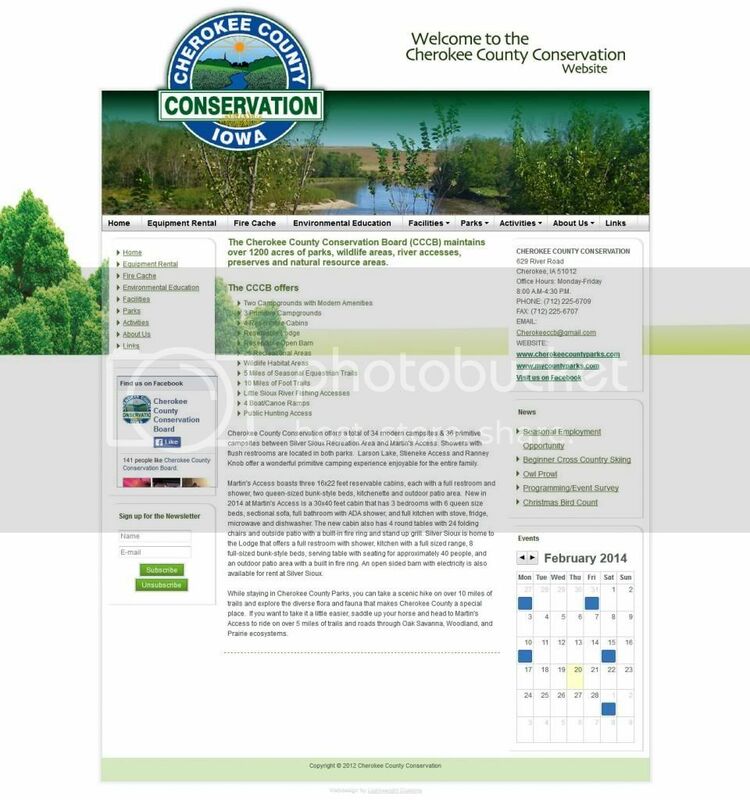 Mac's Preserve Cherokee 600 510th St.
Marcus IA 51035 600 510th St.
Mill Creek Bridge Access Cherokee 5129 Old 21 Rd. Cherokee IA 51012 5129 Old 21 Rd. Mount Pleasant Church Site Cherokee 603 590th St.
Cherokee IA 51012 603 590th St.
Patterson Wildlife Sanctuary Cherokee 5537 550th St.
Cherokee IA 51012 5537 550th St.
Ranney Knob Area Cherokee 760 650th St.
Washta IA 51061 760 650th St.
Redtail Ridge Habitat Area Cherokee 1592 580th St.
Cherokee IA 51012 1592 580th St.
Ritts Access Cherokee 6450 Ritts Rd. Washta IA 51061 6450 Ritts Rd. Soo Access Cherokee 4401 440th St.
Larrabee IA 51029 4401 440th St.
Stieneke Area Cherokee 1010 628th St.
Quimby IA 51049 1010 628th St.